It's not just the economy that's taken a hit from the partial shutdown of the government. Consumer confidence has taken a dip as well, falling more than any time in the past five years and nearly twice as much as in the last prolonged shutdown. According to the University of Michigan's Surveys of Consumers, consumer sentiment has fallen more than 7 points from December 2018 to January 2019. This is in line with – but more than – previous government shutdowns, where sentiment has dropped between 2 and 5 points from the month prior to shutdown. 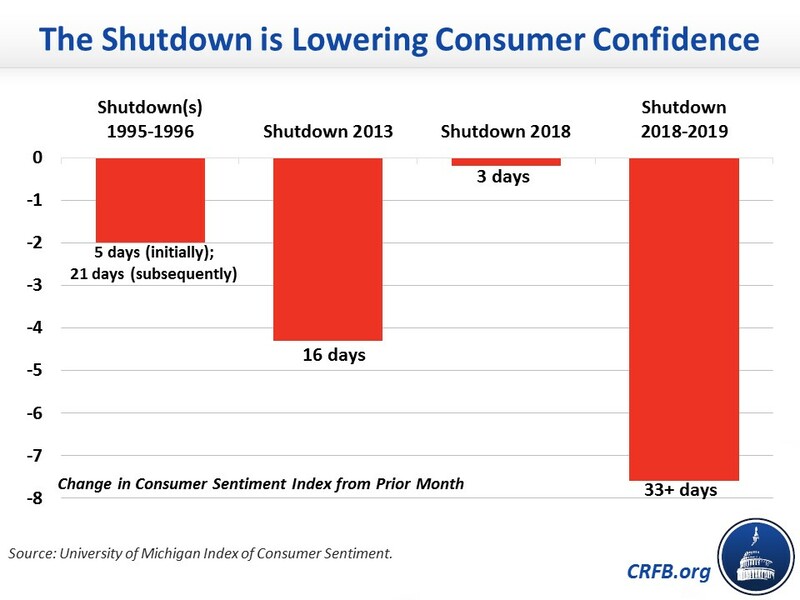 Averaging past shutdowns, each day the government has been closed has reduced consumer confidence by 0.25 points. The uncertainty around when the government will reopen and how the economy will respond is clearly significant. This has been the case in past shutdowns, but it appears to be especially true today. Lawmakers need to reopen the government. This senseless shutdown threatens the steady economic growth we've experienced over the past decade, and it causes needless pain to federal employees and consumers.